Fortune Heights in Barasat, Kolkata North by Fortune Realty Builders is a residential project. 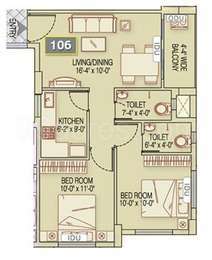 The size of the Apartment ranges in between 705.0 sq.ft. and 1998.0 sq.ft. Fortune Heights price ranges from 23.99 Lacs to 39.96 Lacs. Fortune Heights offers facilities such as Gymnasium and Lift. This is a RERA registered project with registration number HIRA/P/NOR/2018/000091. Bank loan approved from HDFC home loans, State Bank of India, LIC Housing Finance Ltd. and Indiabulls. It is a ready to move and under construct project with possession in Apr, 2018 with few units already sold out. The project is spread over a total area of 5.8 acres of land. It has 70% of open space. Fortune Heights has a total of 14 towers. The construction is of 11 floors. An accommodation of 900 units has been provided. Fortune Heights brochure is also available for easy reference. Where is Fortune Heights located? The project is located in Barasat, Kolkata North. What is the area of apartments in Fortune Heights? The area of apartments offered in the project ranges from 705.0 sqft to 1998.0 sqft. 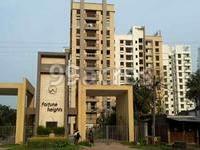 What is size of 2 bhk in Fortune Heights? 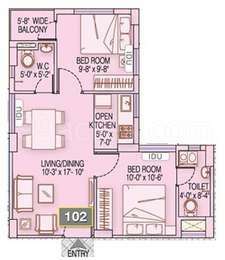 The area of 2 BHK apartments ranges from 705.0 sqft to 940.0 sqft. What is the 3 bedroom size in Fortune Heights? The area of 3BHK units in the project varies from 893.0 sqft to 1830.0 sqft. What is the 4 bedroom size in Fortune Heights? 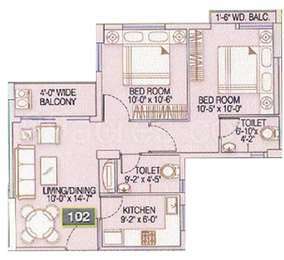 Four-room units (4BHK) in the project are available in an area of 1976.0 sqft to 1998.0 sqft. What is the area of Fortune Heights?The total area that the project occupies is 5.8 Acres. Fortune Realty is a Kolkata based real estate company founded in 1985 by the veteran Dr. R. S. Bhartia. With his 35 years of experience, immense knowledge in various fields and immaculate expertise, Dr. Bhartia has carved out a niche for Fortune Realty in the Kolkata Real Estate sector. His able son, Mr. Padmanabh Bhartia has followed his footsteps to take the Fortune Group a step ahead and set benchmarks among Kolkata Housings & Properties.